Take the sumptuousness of Molly Peacock's own #1 bestselling The Paper Garden, the extraordinary creative variety of The Bedside Book of Birds, and the cat-nip-for-language-geeks appeal of Eats, Shoots and Leaves, and wrap it around tales rich with wisdom and humanity, and you get Alphabetique: the most gorgeous gift book of the season. Molly Peacock has written a new classic, a book of magical tales inspired by the lives of the letters of the alphabet. 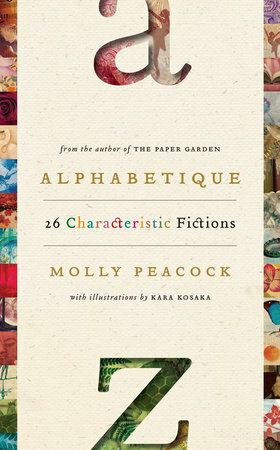 Alphabetique, or Tales from the Lives of the Letters is one-of-a-kind, but nevertheless fits perfectly with Molly Peacock's extraordinary body of work, drawing on the same wellsprings of creativity and artistry as her poetry and her nonfiction, especially The Paper Garden. These 26 charming, incisive, sensual stories of love, yearning, and self-discovery are complimented by Kara Kosaka's layered, jewel-bright collages.